In this post we are going to focus on the scripts included in FTD and FMC operating systems that help to troubleshoot connections between FTD sensors and Firepower Management Center. As they are run from the “expert mode” (super user), it is better that you have a deep understanding of any potential impact on the production environment. There is a script included in the Firepower system called manage_procs.pl (use it wisely). It can be run from the FTD expert mode or the FMC. It allows you to restart the communication channel between both devices. Be careful, if you run it from the FMC and you have hundreds of sensors it will reestablish all communication channels to all of your sensors at once. 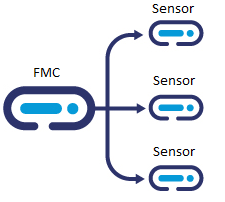 If you run it from the FTD then only the particular sensor – FMC communication will be affected. I am using 3th, 4th and 5th option. It can take few seconds to proceed. This scripts are nice to be used when the FMC and FTD have communication problems like heartbeats are not received, policy deployment is failing or events are not received. These options reestablish the secure channels between both peers, verifying the certificates and creating new config file on the backend. If you still have problems then you can see all the debugging messages in a separate SSH session to the sensor. A good way to debug any Firepower appliance is to use the pigtail command. It gives real time outputs from a bunch of log files. So lets execute manage_procs.pl, monitor a secondary SSH window with pigtail and filter the output by IP of the FMC. Keep in mind that you may use the pigtail command during the registration process and monitor where the registration is failing. Another great tool inherited by Sourcefire is sftunnel_status.pl. It is a script that shows all details related to the communication between the sensor and the FMC. The most important are the outputs showing the status of the Channel A and Channel B. These are the management and the eventing channels. In more complex Firepower designs these are two separate physical connections which enhance the policy push time and the logging features. Dealing with Cisco Firepower Management Center (FMC) and Firepower sensor communication. Registration process.